Founded by a pair of industry veterans; Aaero is the second project to come out of the two-man studio at Mad Fellows Games. The first was a rhythm shooter called Sine Wave that arrived on Apple devices nearly two years ago. In that time, the team has created another rhythm experience that builds upon the framework of their previous title and infuses it with a genre of music games that should feel instantly familiar to fans of Tetsuya Mizuguchi. The result is a rhythmic shooter that players will need to use both analog sticks and a keen sense of rhythm in order to survive. Taking some notes from Rez for inspiration, Aaero follows a similar style of locking-in and shooting enemies to the beat. 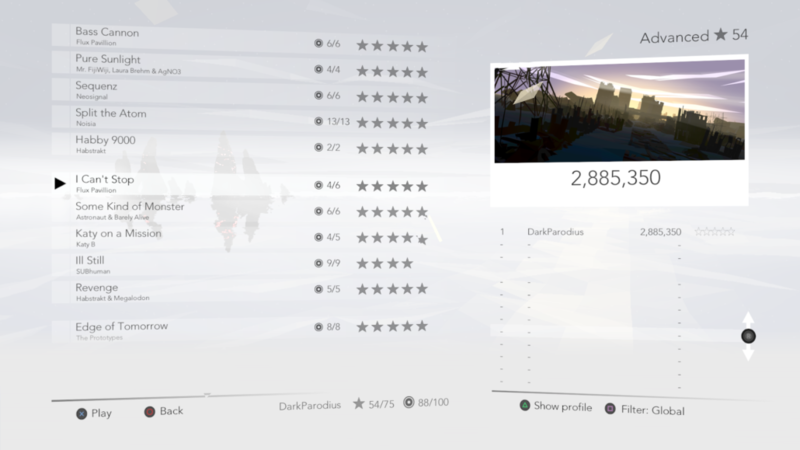 However, unlike its predecessor, Aaero doesn’t make its own beats. Instead, enemies only explode on the beat and seem to give a higher score bonus for doing so. This gives the player incentive to tag as many targets at one time and let loose a salvo of rhythmic bullets on the beat unless they plan on eating a counter attack and lose one of their three stocked lives if they aren’t quick enough on the draw. That’s simply what the player must manage with the left analog stick. With the right joystick, players will navigate their ship around environmental hazards and try to dodge enemy fire, but more importantly, ride the beats during each song’s numerous precision interludes. Whereas Rez guided the player along without any input on movement, Aaero requires both analog sticks in tandem to guide the ship around as it navigates along swipes and scratches of each rhythm track. For high score hunters, this is where the bulk of a song’s scoring comes into play and sequential stanzas can quickly build the player’s score multiplier. While operating both analog sticks took some willpower to get accustomed to, I found myself frequently entering a zen-like trance throughout each song and moving along to the beat without even paying attention to my hands. When you can get into the zone and just glide along with the music, THAT is where Aaero truly flies above the rest. All fifteen of Aaero’s eclectic tracks delve into a number of electronic genres and could easily be added to any house party playlist. There’s a wide diversity, whether you’re in the mood for vocal trance or some dirty jungle beats. While the tracklist might be considered small for a rhythm game, each experience is handcrafted and tailored to levels that feel much different than the ones that follow. Taking part in the finale of each five-track block lies a boss fight that takes place across an entire song, unlike the last minute or so of a level in Rez. These hulking monstrosities throw more attacks at the player than any other regular enemy and knowing how to recognize a boss’ attack pattern and swap between targeting their massive frame and the missiles they launch out is paramount to the player’s survival. Even days after setting the controller down, I can still remember the beat patterns to some of the more complex tracks. The Advanced chard to ‘Ill Still’ still has me bobbing my head to the beat: left, right, left, spiral then right, left, right, and another spiral. It’s a testament to how the duo at Mad Fellows has crafted a rhythm experience that sticks with the player. By giving each song its own pattern of notes, both for the shooting and rail-gliding segments, Aaero’s higher difficulties require a bit of memorization that’s not unlike learning a musical instrument. 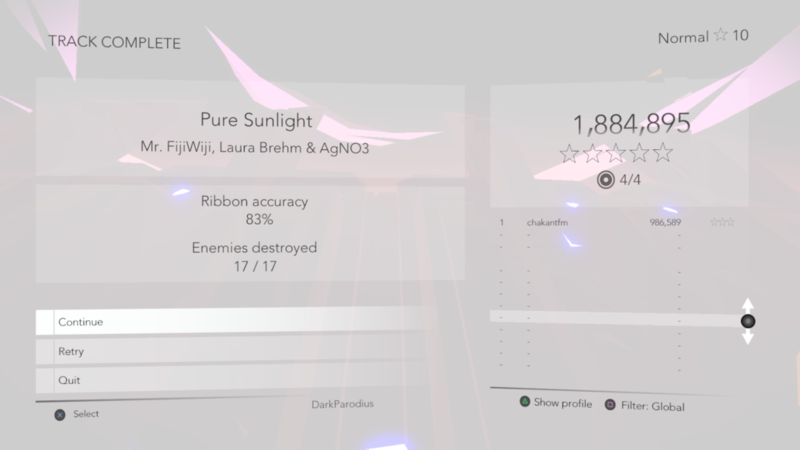 To incentivize the player into improving their score, Aaero operates on a star-based unlock system, By earning up to five stars in a song, players will unlock the next song (and difficulty) based on an accumulated amount. With seventy-five possible stars earned across all of the tracks, players might only need about fifty of them to unlock the Advanced difficulty. 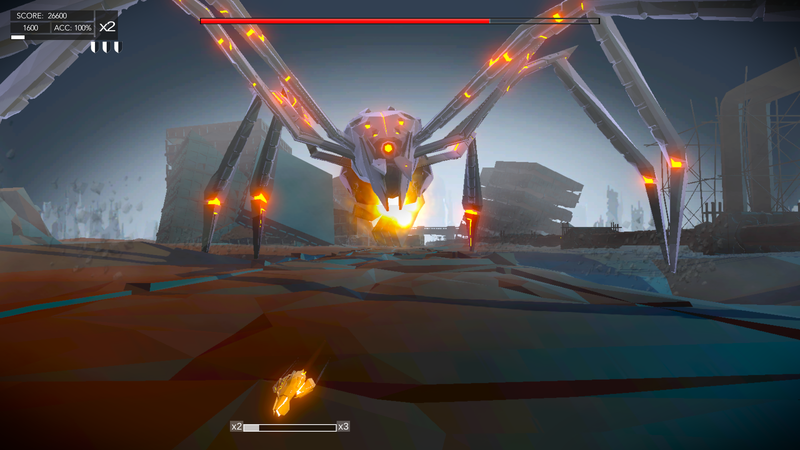 The highest difficulty, however, requires a full mastery of Aaero’s mechanics and all one hundred and fifty stars to unlock. Despite my best efforts, there were a couple of tracks that I simply couldn’t get my score high enough to get any higher than four stars. It pains m to admit failure when critiquing a game, but I suspect this will be a challenge for all but the most rhythmically inclined. Part of my frustration with the scoring system is how much even a single mistake can throw off your chance of five-star success. Getting up to a multiplier of eight is easy as long as the player does well; it’s keeping the multiplier that can be frustrating. All too often, I’d veer my right analog stick too sharply during the rail segments and miss that stanza, taking a hit to the ship’s three life pool but more importantly, cutting my multiplier down by half. It’s certainly better to go down to a four-times score multiplier than to lose it completely, but some tracks have such a high threshold for a perfect five-star rating that it can be impossible to break that mark without starting the song over again. Aaero is rhythmic perfection that requires the same out of its players. Without feeling each song’s patterns and becoming an ace Aaero pilot, players stand no chance of even seeing the highest difficulty. If you were a fan of the likes of Rez and Audiosurf, you owe it to yourself to play this Mad Fellows’ original. Reviewed on PlayStation 4 (code provided by the publisher). You can buy it for PlayStation 4 digitally via Amazon. Aaero seamlessly blends twin-stick shooting with trance music to create a sensory experience unlike any other.